3G Is A Game Changer For India. What You Can Do With 3G In India. After a long wait which was frustrating, India will finally get access to 3G services in the next few months. India has been missing on 3G which is a norm in countries like US and continents like Europe. 3G not only brings higher data transfer rate, but also better voice clarity. Another advantage of 3G is that it allows simultaneous usage of data and voice. In India, data services have recently become popular thanks to heavy usage of social networking sites like Facebook and Twitter and video and picture sharing services like Flickr and YouTube. Another important reason behind this is the introduction of cheap data plans from many telecom operators like Tata DoCoMo. 3G services were launched in India by BSNL in late 2009-early 2010. Since BSNL is known for its poor network, I never bothered to check out how their 3G service was. Recently, the 3G spectrum auction was concluded in India, and most of the telecom operators will be launching 3G services in India by this year-end or early next year. The first private operator to launch 3G in India will be Tata DoCoMo. Tata DoCoMo is a merger of Japan’s NTT DOCOMO and India’s very own Tata. 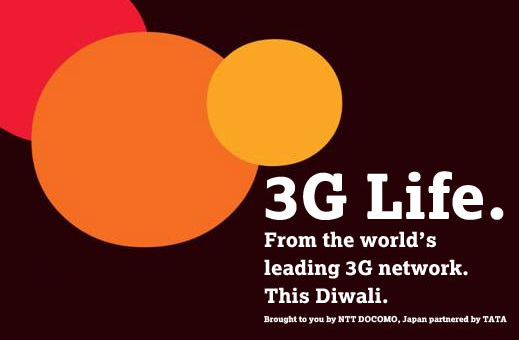 Tata DOCOMO has promised to launch 3G by Diwali (November 5) in India. You can find more information about 3G at http://www.3glife.com/. Tata DOCOMO is no stranger to innovation in the Indian telecom industry. Tata DOCOMO were among the first private operators in India to announce the per second calling scheme. The company has in a very short span of time managed to get a lot of customer and appreciation due to the reliability of its services. A 3G Life will allow me to watch live sports on the go on my mobile phone. I can watch all those cracking shots from Sachin Tendulkar or watch the beautiful goal scored by Rooney. Thanks to 3G, I will never miss all those exciting nail biting moments of a match while I am on the move. I can easily watch them on my 3G phone like HTC Desire. In my 3G life, I will be able to access emails and documents quickly on the go, making use of several internet enabled document creation services like Google Docs, Zoho and Microsoft’s Docs.com to instantly create documents, all from the comfort of my phone. If I realize that I have made a mistake in a presentation I am going to present, I can use 3G to quickly make changes to it while I am on my way to the venue itself. No more fumbling with the presentation just moments before presenting it. Being a blogger, it has happened to me many times that my net has stopped working during an important online tech event or while covering some breaking news. In my 3G life, I can simply use my phone as an Access Point by tethering internet to my laptop or PC and then get back online and finish my important blog post. Since 3G provides very high data transfer rates, I won’t miss the speeds of my wired or wireless net connection at all. In my 3G life, I can stream videos right from my PC located at my home to any device irrespective of my location. This would allow me to share some precious videos with my friends and/or relatives whenever I meet them. The joy of recalling all those crazy school and college memories by watching those videos is only possible in my 3G Life because of the high download speeds offered by the 3G technology. I can also use the 3G service to quickly record videos and share them online using services such as Qik. This would allow me to show people who matter to me things even when they are not around me. Thanks to the high bandwidth offered by 3G, I can use numerous VOIP applications on my phone in my 3G life. With the help of VOIP based applications like Skype and Fring I can talk to my dear ones at low costs, irrespective of their location. I can also have a video chat with them for free by using Yahoo Messenger Video Call feature or Google’s own Video Chat feature. Being a very active Twitter user, on the go, I have many times bumped across interesting tweets accompanied by a link. Most of the time, I have to favorite that tweet and read it later on when I have access to a faster net connection. All this, just because the slow speeds offered by GPRS will take ages to load the web page. In my 3G Life, I can simply click on the link in a tweet and read the article at that very moment. Along with the above mentioned advantages of 3G, another important advantage of 3G which is rarely highlighted or marketed is that it brings better voice clarity. So in my 3G Life I can hear the voice of my dear and near ones clearly. 3G in India is no longer a dream, it is going to turn into reality pretty soon. With the help of 3G services, users from all across the country will have access to better features, high data transfer rates and better voice clarity. Small businesses in India can take advantage of the 3G services to access their business on their phone, keep in touch with clients through email and quickly send documents to them without even having to have access to computers. For people in rural areas where Internet has not yet reached, the 3G service will open a new mode of communication. Bloggers will also benefit and be able to do more things without having to worry about the bad internet connection in India. As for other people, they will have access to more entertainment and social networking on the go. Is 3G life required in India. Absolutely yes, it is definitely going to be a game changer. I hope when Tata DOCOMO launches 3G in India by Diwali I will be able to live a true 3G Life. I have known people who take a vacation to just relax and stay away from Internet. In fact, not so many years ago, travelling in a plane was comforting because you knew that you did not have access to the Internet. Then came in offline storage for Google Reader, Gmail and a bunch of other services, which meant that you had access to content even on a plane. This was quickly followed up by Internet access on planes. See where we are headed. If you thought that you could escape the Internet by climbing the highest mountain peak in the world; Mount Everest; think again. Ncell, a subsidiary of a Swedish phone giant TeliaSonera, has set up high speed 3G networks at an altitude of 5,200 meters in the Everest region. "Today we made the (world’s) highest video call from Mount Everest base camp successfully. The coverage of the network will reach up to the peak of the Everest" Ncell Nepal chief Pasi Koistinen told reporters in Kathmandu on Thursday. This means that you can no longer fool your wife when you say that you were busy climbing Mount Everest while you were busy playing golf, because you will now be able to make videos calls and surf the Internet on your mobile phones. Sigh, will we ever be able to get rid of the Internet? Do you think that they would have high speed internet in Heaven and Hell too? Tata Docomo, known for bringing many firsts in the Indian Telecom industry, will now also become the first private Telecom player to launch 3g cellular services in India – this diwali. Other operators like Vodafone and Reliance are likely to announce their respective 3G services launch date soon. Mr Deepak Gulati (President of Mobility, Tata Teleservices Ltd) said, We are all set to launch 3G services on Diwali. With this customers will have access to high speed Internet access and rich multimedia content and applications. Our partners NTT DoCoMo are leaders in 3G services and we are leveraging their expertise to bring the best to our customers. Tata Docomo has initial plans of launching their 3G service in all the top cities of the states where Tata Docomo has presence – Delhi, Mumbai, Maharashtra, Gujarat, Tamil Nadu, Kolkata, Haryana, West Bengal and Uttar Pradesh (East). Tata Tele has also given the 3G equipment contract to Nokia Siemens and Chinese vendor Huawei. Here is a good news for all the BSNL subscribers across India. BSNL has announced up to 45 percent reduction in their current 3G tariff. BSNL have finally triggered another price war in the 3G Mobile service segment, even before the private operators have started their 3G services in India. BSNL has not only reduced the price of its 3G service, but they have also launched new prepaid and postpaid plans for its 3G subscribers in all the telecom circles. BSNL has significantly reduced the price of its Unlimited 3G Data Plan from Rs.2,499 to just Rs.1,359 for postpaid subscribers and also reduced the price for their prepaid subscribers from Rs.2,756 to just Rs.1,499. They have also reduced the price of the existing data Plans of 500 MB, 1 GB and 2 GB data plans to a great extent. Apart from that, BSNL has launched three short term validity plans which offers 1 days, 3days and days validity at just Rs.10, Rs.25 and Rs.50 respectively. BSNL subscribers can enjoy the lightning speed of 3G services with their High Speed Wireless Broadband which provides up to 7.2 Mbps in Home and Roaming circle anywhere in India without any extra charges. Currently BSNL offers their 3G services in more than 500 cities across India. Amazon just announced in a press release that the Kindle would be getting a price cut. The Amazon Kindle is an e-book reader, with 3G capability. The Kindle has access to the Kindle store, which has more than 600,000 books. As of now the Amazon Kindle, retails for $259, but beginning from today the device will retail for $189. Even with the reduced price, the Kindle will still come with free 3G wireless service. I guess the price cut can be attributed to the strong sales of the Apple iPad. The strong sales of the iPad might have forced Amazon to reduce the price of the Kindle. It might also be possible that Amazon will be launching a new version of the Kindle this summer, and so they are reducing the price of the eBook reader. This price cut can also come in response from the Nook reader, which features Wi-Fi, and will retail for $199. Here is the link to the Press Release. India is a country where voice is given more importance than data communication over a cellular network. Although, this situation is changing now, but mobile broadband is limited to selected pockets in the country. On the other hand, service providers are more interested in owning bandwidth to release them under high costs which is not always affordable to people. At a recent 4G auction, (which seems useless currently in itself has India is still not living in a 3G world) Infotel, a mobile broadband provider bought the largest share of 4G spectrum and won the bid for all 22 regions this bid was being placed. One factor that makes Infotel so much better than its competitor is that it has nationwide wireless broadband operations, possibly the largest; making it the de-facto ruler in this sector. Others in this race, Aircel, Tikona Digital and Bharti, each got eight, four and four licenses respectively. Seeing this state, Mukesh Ambani who currently holds the Reliance Industries, is now proposing to buy Infotel for $1 billion and also agrees to pay the licensing fees. This desperate move will make Reliance Communication and Reliance Industries tough competitors in the mobile business once again. What is expected of Reliance Industries now is that it understands the current #fail scenario and need of wireless broadband in India and tries to make it better. We all know that Sling Media is currently working on the SlingPlayer mobile application for the Android OS. Apparently, Sling Media has sent out private beta of the application to a few Android users. SlingPlayer allows users to watch television on their phone over a 3G connection. The application is scheduled to be released sometime in Summer, this year. The wait is finally over! A new private beta is available for the SlingPlayer Mobile for Android. Since your beta profile is a good match for testing, you have the opportunity to join the new beta program. Hopefully, a public beta of the application will soon be available for the general masses. After what seemed like an endless delay, the Telecom ministry has finally resolved its issues with the defense ministry. Hurray! We had lost hopes so much that, we started speculating whether 4G would arrive before the launch of 3G. The Department of Telecom (DoT) will issue Notice Inviting Applications (NIA) from the potential bidders by the end of this week. All pending issues have been resolved," said telecom minister A Raja. Though it’s unclear of how many slots would be allocated in each circle, rumor is that state government will be allotting as much as four slots to new players, due to availability of excess spectrum. Even before the 3G service has been deployed in India, India is now getting ready to welcome the fourth-generation (4G) service. The early preparation might help in introducing the service in next four years at least (Work on 3G started way back in 2003). The Telecom Regulatory Authority of India (TRAI) on Wednesday sought industry views on advanced 4G mobile systems, as it prepares a consultation paper on the new technology, that it said would be 10 times faster than 3G. It is necessary that our country should be prepared to introduce 4G services at the earliest,” the TRAI said. Countries like Sweden are already enjoying the 4G service. he TRAI said it would deliberate on issues such as pricing of spectrum and licensing in its consultation paper. There were talks that Indian operators might skip 3G altogether, but now that looks highly unlikely as we have seen that operators upgrading their network for 3G. Do you think 4G might arrive earlier than 3G, considering there won’t be any problem with the spectrum allocation? CDMA and GSM telecom service provider, Reliance Communications is set to launch its own App store. RCom, will soon launch Mobile Applications Stores across the country through its data portal, RWorld. Just this morning we saw the news of another operator, Airtel launching its own App store. By the end of March, even Aircel would be launching its app store. RWorld 2.0 would be 3G ready and will support all latest features available on mobile handsets such as on-device portals, idle screens, widgets and RSS readers. The first version of the store would go live on GSM handsets later this month and the expanded version will be launched across CDMA and GSM handsets later this quarter. Reliance Communications has a customer base of 100 million.